I have an exceptionally solid conclusion on pendulums. I think pendulums are “an intense learning instrument”. So what precisely would it be advisable for them to be utilized for? To help you to understand the power behind the “Law of Intention”. How does that work? 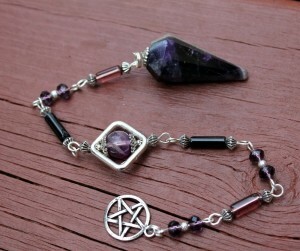 Because pendulums can be manipulated by your very own energy…and it is an amazing thing to witness! Especially when you are the one making the pendulum move. This is why you should not ever use pendulums to help you find the answer to a question. Especially if you are trying to get an answer by watching the way in which it moves or spins. Because you can manipulate pendulums, in essence manipulating your answer. By the same token, you can manipulate a pendulum…by using your thoughts or by the “power of intention”. Wow! How cool is that? To have something you can physically see, be affected and manipulated by something you cannot see? I have heard that you cannot manipulate a crystal or a acrylic pendulum, but you can. I have done it, many times, and have shown others how to do it to. And frankly, learning how to direct your energy in such a way that you can “feel” your intention, is a way more powerful learning tool then having it tell you “yes” or “no” to a question. So I feel that “the real power behind the pendulum” is extremely underutilized, over looked, or not even known to most people. Through this exercise you will experience “the power of thought”. You will actually experience how it “feels” when working with the “Law of Intent”. You will really get to see how powerful your thoughts are, and discover how your intent actually has an external effect on the world around you. 1) Find a pendulum or make a pendulum. If you do not have a pendulum you can use a light string or piece of thread to attach the pendulum to. Then for the pendulum, find something weighted, (it can be a screw, bolt or nut), and attach it to the bottom of the string. I often bring a piece of thread and a screw for my students as they are common household objects that they can find at home. 2) Find a sturdy place to rest your elbow like a table. 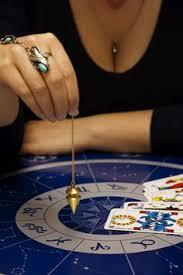 Then, place you elbow on the table and hold the pendulum string between your thumb and pointer finger. Your forearm should make about a 45 degree angle with the table. 3) Hold the pendulum steady with the other hand to initially stop it from swinging. Once the pendulum is still, then release it gently. 4) Concentrate on “seeing” the pendulum move in a circle clockwise. As you concentrate on the pendulum you will begin to see it move slightly. Keep “seeing it” move in your mind’s eye, in a bigger and bigger circle clockwise. 5) After the pendulum is moving quite well clockwise. Imagine that you now want to “see” the pendulum move in the opposite direction, counter clockwise. Now visualize and imagine that you can make the pendulum move counter clockwise just by thinking about it, and “seeing” it happen. While you are concentrating on moving the pendulum counter clockwise, you will begin to see it slowly stop, and it will begin to move in the other direction. 6) Next you can try moving it from side to side, or forward and backward, in the same manner as above. Practice this and have fun with the exercise. It might start as subtle movements at first, but the more that you practice this exercise, the better you will become. You will learn how to “harness” and focus your energy. As you learn how to focus this energy you will begin to able to move the pendulum with ease, whichever way you chose, faster and faster. This is a really great exercise which helps train you how to “direct your energy” properly when it comes to bringing things into your life. It is important to know that this is how “the power of intent works” with energy that is directed by you in the physical world. It is the same concept when working with “the power of intent” which forms things in your future by just imagining them. When you really begin to “feel” how this works with the pendulum, then you can begin to direct and feel this same energy during meditation, while working on creating desired outcomes.